The spirit finds voice in music as it does in life, through the magic of passing moments. 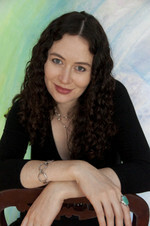 The works of Australian-British composer Alicia Grant have been performed by renowned orchestras and ensembles, including the Melbourne Symphony Orchestra, the Choir of Westminster Abbey, the BBC Singers, New College Choir, the Oxford Philomusica, and the Tasmanian Symphony Orchestra. Performances of her compositions have spanned the globe: twice premiered at Carnegie Hall, New York, and featured at prestigious venues in the UK, Australia, Argentina, the Netherlands, New Zealand, and France. Frequently broadcast on radio, her catalogue is steadily becoming available on commercial releases. The CD Rainlight: Evocations of Water for piano solo by Jeremy Eskenazi showcases her piano music (to be released this year on the Divine Art label). Other recordings that feature Grant's work include the DVD One Minute More by American pianist Guy Livingston in collaboration with Dutch filmmakers, and the CD British Music for Choir and Piano by the New Cambridge Singers. Grant achieved the distinction of Doctor of Philosophy (DPhil) from the University of Oxford in 2008. The recipient of an ORS Award and Clarendon Fund scholarship, she studied composition with Professor Robert Saxton at Worcester College and was awarded the John Lowell Osgood Memorial prize in 2004. Grant also holds a LRAM and first-class BMus(Hons) degree from the Royal Academy of Music, University of London, where she studied composition with Simon Bainbridge. Whilst at the Academy, she won numerous scholarships and prizes including the Charles Lucas prize, William Elkin prize, and the Arthur Hinton Memorial prize for composition. Grant continues a scholarly interest in the philosophy of music, particularly in the cross-over applications of 'embodied realism' or 'experientialism' and research into musical meaning. Grant is known for her specially commissioned work, ANZAC Anthem, for choir and organ, which was premiered by the Choir of Westminster Abbey in the presence of Her Majesty Queen Elizabeth II and the Duke of Edinburgh in 2005. This anthem continues to be regularly performed at Westminster Abbey and other memorial services that mark Australia and New Zealand's national day of remembrance. Three magic pieces : for cello and piano (2006) Commissioned by Oliver Coates.